Former premier Najib Abdul Razak came to the Kuala Lumpur court complex today to post the first portion of his RM3.5 million bail by paying RM1 million. He came with his son Norashman and his bailors Mohd Nizar Najib and Mohd Shahrir Arifin at about 10.50am and went to the Sessions Court registry to sign various documents related to the bail application. Najib spent about eight minutes completing the process, then left in a white Toyota Vellfire. He told reporters that he paid the first portion of the bail as decided by the judge. “We will pay in stages, as set by the judge,” he said. He has until Sept 28 to pay up the remaining RM2.5 million. Yesterday Najib faced four charges of abusing his power under the MACC Act 2009 as prime minister, finance minister and 1MDB Board of Advisors chairperson to obtain gratification of RM2.28 billion from 1MDB. This sum includes the funds pertaining to the RM2.6 billion donation scandal, concerning the transfer of US$681 million (valued at RM2.08 billion at the time) to Najib’s personal bank account in March and April 2013. 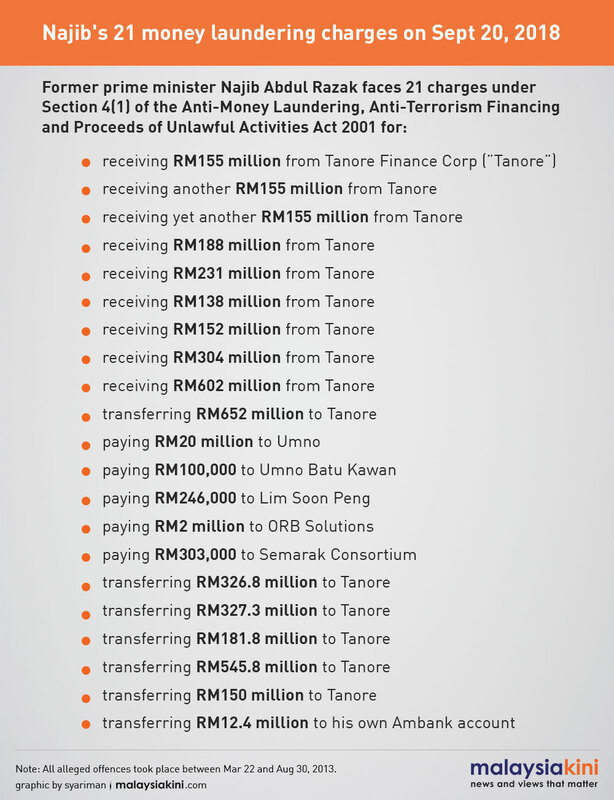 He also faced another 21 counts of money laundering pertaining to all transactions involving the RM2.08 billion. He claimed trial to all charges. Najib had earlier claimed trial to four counts of criminal breach of trust and abuse of power and another three counts of money laundering concerning RM42 million from SRC International Sdn Bhd, a former subsidiary of 1MDB.